Don't faint! I am actually doing 2 post in 2 days. Starting New Year commitments early. I want to share another Fall-inspired card with you today. I absolutely love the new set in the Holiday Mini called "Gently Falling", it is beautiful. It is one of our 2 step stamping sets. It is designed with an outline stamp and a filler stamp. Gives you lots of options!! 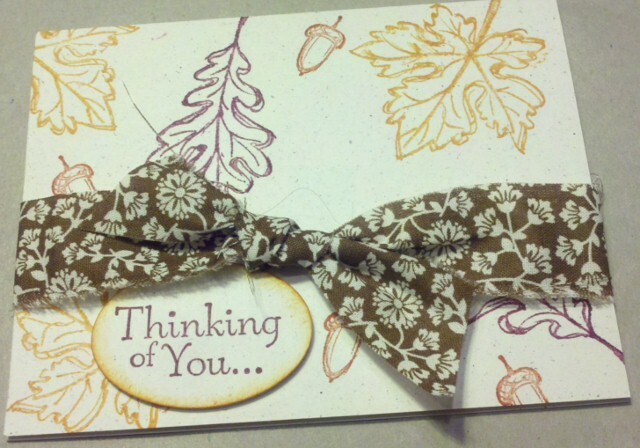 This card is stamped on Natural white cardstock with Perfect Plum, Cajun Craze, and More Mustard. I used the Designer Series fabric from the fall collection instead of ribbon for the bow. Have a great day and be blessed friends. Well, another month has come and gone. I just stay behind...way behind. Anyway, it has been a busy month, Tommy had a birthday as did I, started a new hostess club (yay!! ), and a whole host of other events taking place weekly. Stampin Up is running an awesome promotion, "It's great to be a hostess right now". With a 350.00 workshop, the hostess gets an additional 35.00 of FREE Stuff. Runs through the 15th of December, so if you want to host a workshop and do some additional shopping, just call or email me soon. I also have a BAGs, TAGs and Christmas Cards class coming up November 29th. Drop me an email if you are interested. But don't wait, it's already half filled. Monday morning Stampin Up is hostessing an online shopping Extravaganza. Check back for details. It's late. Gotta run. Blessings!!! !